Page 3 | Aubrilam's News. See the video: our latest creation in the Netherlands! For the lighting in Lang Gewenst square right in the centre of Hilversum, Aubrilam’s Dutch partner Industrielicht chose very high lighting columns fitted with Lumenpulse projectors. Seven 14-metre-high Athena XL columns with special brushed finish bedeck this newly renovated square. The high-profile inauguration of the new McDonald’s restaurant on Rua Henrique Schaumann in São Paulo took place on 26 July. Fully refurbished, it is the first in Brazil to offer a brand new restaurant concept developed by South American franchise Arcos Dorados: the façade and inside layout have been completely revamped! 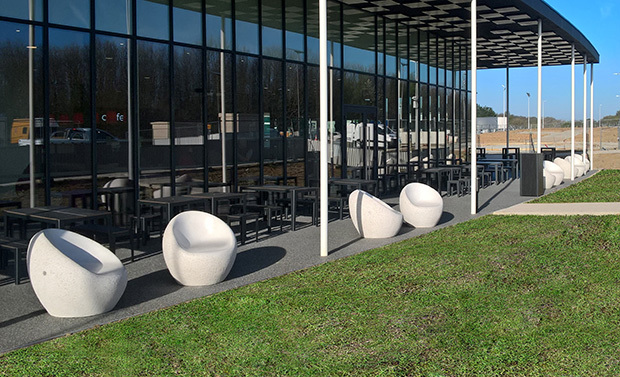 Our custom-designed McDonald’s furniture fits out the two outdoor areas: 4- and 8-seater tables, high 8-seater tables, lounge areas, planters, bins, barriers, lighting and shelters. These two terraces have been optimally designed to each cater for slightly more than fifty people. Other “new generation” restaurants will appear in Brazil and in other South American countries too. With the aim of extending its product portfolio, Aubrilam created a partnership with the Italian manufacturer Bellitalia. A company chosen for its strong leading position in the sector of urban furniture in concrete and marble stone. A common factor will be the embellishment of external spaces. Bellitalia, both from its experience and its ability to innovate, appears as the ideal choice to complete the offer of Aubrilam and thus to meet demands of the urban furniture market. The products developed by the Italian brand complement perfectly the current line of furniture; the design and high quality finish exceeds market expectation. These two companies share a common goal aimed at developing product range that comply with new requirements of outside areas. We are joining forces to offer even more innovative solutions, using both the research of new materials and the desire to provide dynamic new lines within the market of urban furniture. Aubrilam makes space alive by enhancing its true identity and personality. As specialists involved with outdoor developments for 40 years, Aubrilam’s mission is to give life to space. We provide the substance: alive, sustainable, meaningful, economic and aesthetic street lighting and furniture. Please fill all the required field.